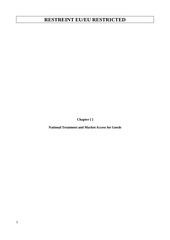 This PDF 1.5 document has been generated by Microsoft® Word 2010, and has been sent on pdf-archive.com on 31/01/2017 at 03:08, from IP address 62.215.x.x. The current document download page has been viewed 336 times. File size: 754 KB (75 pages). comparison and analysis of statistics of Intra-GCC trade and international trade. 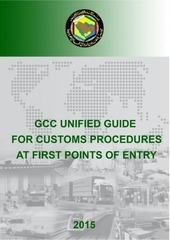 Customs Procedures at GCC First points of Entry”. 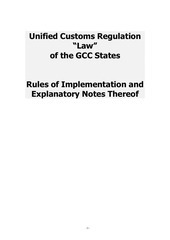 would be implemented as of January 2015 across all GCC first points of entry. fulfill one of the most important requirements of the customs union. 1. An evidence of the importer's activity to obtain the customs code. competent authorities concerning restricted goods. customs office, when so requested. otherwise, a security or bank guarantee to be submitted. customs office for finalization of the customs operation. trips, for finalization of the customs operation. clearance system applicable at each customs office. intellectual property rights, may not be imported. (according to risk assessment criteria). , as well as the international code for chemicals or hazardous goods. importer, his representative or the authorized customs broker. applicable at the customs office. 5. Issuance of the exit order and release of the goods. Residence Visa to complete the customs operation. 3. He shall not be a trader. the automated clearance system applicable at each customs office. finalization of the customs operation. that do not operate regular trips, for finalization of the customs operation. international code for chemicals or hazardous goods to be indicated). 1. 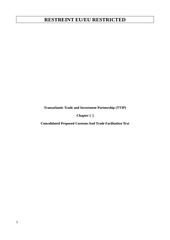 An evidence of the exporter’s activity to obtain the customs code. customs office prior to/ or after release of the goods, when so requested. This file has been shared by a user of PDF Archive. Document ID: 00546107.